It’s clear to see from the first and last outfits below, that I wore on holiday last week, that the weather in Devon was somewhat changeable. Our first full day, Sunday, saw us wrapped in layers and waterproofs and trying to avoid the howling wind and driving rain. The weather improved steadily as the week progressed and Friday saw us sitting on the beach all day, without needing a windbreak and warm enough in the evening to wear shorts and a lightweight top. Packing for a UK beach holiday is tricky. I knew what to expect from the weather forecast so packed accordingly to cover every eventuality. But, and I’m certain I won’t be alone in this, I over packed (big time) and probably wore less than half of what I took. So I thought it might be useful to see what I wore over the course of the week and to perhaps make it a little easier for anyone else going on a similar type of holiday. It’ll also to serve as a reminder to myself for next time not to take so much and to make life easier when packing the (smallish) car boot. We drove down from North Yorkshire on Saturday morning, a journey which took seven hours excluding a stop at Gloucester Services on the M5. I’m giving specifics because it was possibly the nicest, most upmarket service station I have ever visited. It’s a farmshop with a cafe as well as a coffee and snack bar and a lovely gift shop. It made the stop so much more pleasant. I correctly anticipated a lot of stop-start driving through several lots of roadworks on both the M6 and M5 so I made sure my shoes were comfy and not too heavy. Being comfortable is important when having to sit in one position and concentrate for prolonged periods so I wore a breton top, my yellow brogues and my least skinny skinny jeans. My children and I stayed in a self-catering apartment opposite Woolacombe Beach and I knew we’d be mostly eating out. Having been before, I knew the vibe was very laid-back and relaxed, reflecting the beach and surfing culture. Flip flops, shorts and hoodies are de rigeur, even in bars, cafes and restauants. But even though I knew this, I still packed two dresses just in case as well as several smarter tops. Needless to say they didn’t leave the wardrobe. As I said above, Sunday was wet and windy. I wore a breton top, high-waisted skinny jeans and brogues, topped off with a rain jacket. My yellow handbag serves almost as a neutral and I wear it with numerous outifts several times a week. The brogues, being leather, are waterproof to a certain extent, so were a good choice for the rain. I did want to dress the outfit up a little so added a statement necklace that has bright yellow accents to compliment my bag. I could have managed perfectly well without these jeans, wearing them only once. Monday was very windy, particularly in the afternoon. We spent a short time on the beach and then took refuge in a cafe for hot chocolate and cake, the therapeutic value of which should not be underestimated, especially when with a 14 year old and a 12 year old. I wore a jumper, casual skinny jeans (my least skinny skinny jeans as worn for travelling), and pull-on trainers. I’d booked a table at a pub in a neighbouring village for Monday evening and as much as the outfit above would have been more than smart enough, I do like to get changed in the evening when on holiday and eating indoors (rather than eating at the beach cafe). I changed into a pretty broderie anglaise top and added tan leather sandals, a gold dragonfly pendant and gold wrap bracelet. Tuesday was still a little windy but dry and warmer than the previous two days. We spent the day walking along the beach and having races. Casual skinny jeans, a breton in a slightly heavier weight cotton and flip flops were ideal I also added a scarf. By Wednesday, the sun had come out sufficiently for me to wear shorts. I kept the lightweight sweater on all day and needed to add a hoodie too when sitting on the beach. 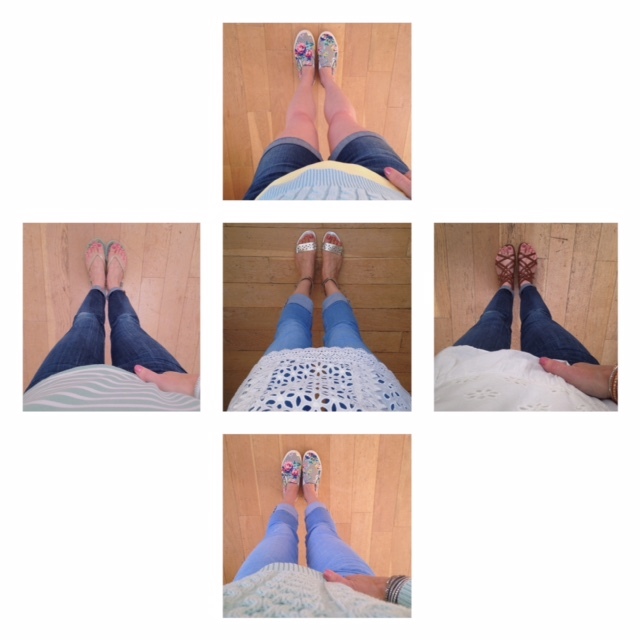 Blog Post:My outfits and a tale of two curries. Again, for the evening, my shorts and jumper would have not looked out of place, but I decided to get changed because we were to eat at a cafe bar. I’m thrilled with these cropped jeans. they were a recent sale purchase and exactly what I’d been looking for. 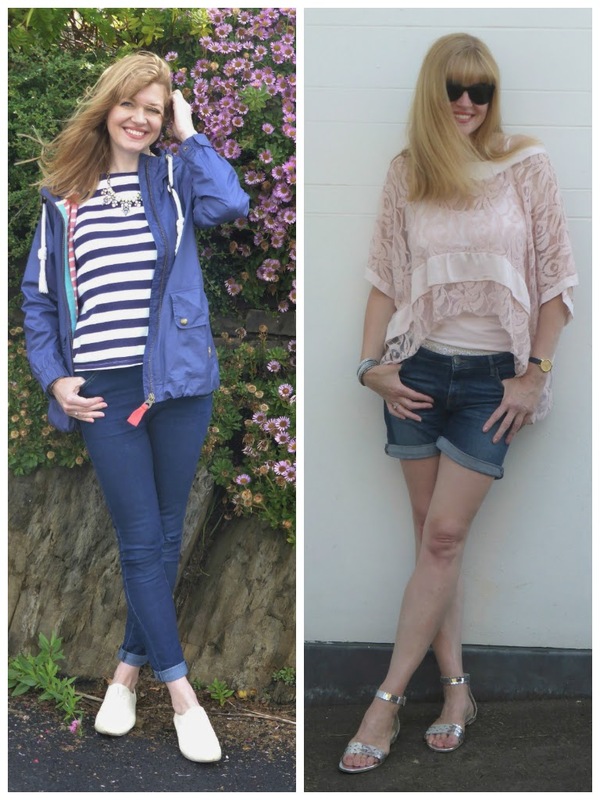 Blog Post: My outfits and a tale of two curries. Thursday was a beautifully sunny yet breezy day and we spent it on the beach. I wore my denim shorts and yellow vest and on this occasion, only needed the hoodie when paddling. The sea breeze was really quite chilling. We ate on the beach in the evening so I rewore clothes from earlier in the week. Cropped jeans, mint green jumper and pull-on trainers along with some some fabulous new sunglasses. Blog Post: Outfit- sunglasses because the sun shone. Friday was sunny, warm and calm and again, we spent the day on the beach and wore my denim shorts again with a different vest top and flip flops. Our last evening was spent eating on the beach where it was warm enough for me to wear my blush lace top with jeans and sandals. Blog Post: Outfit. Blush pink lace top and denim shorts. I took a minimum of accessories, all of which wore, (all outfit details and pictures are on the individual blog posts, the links to which are under each photo). The wrap bracelets are brilliantly lightweight and comfortable and went with every single outfit. I could have managed without the cream and red bag. I took it because it’s the prize I got for winning the Bonprix bikini style challenge and I wanted to use it. I’m delighted with it. The navy and mint green tote bag was invaluable as a beach bag. I use it frequently both as an overnight bag and as a laptop bag too when out and about. I could have managed without the tan sandals too. I only wore them once and the silver ones would have worked just as well with that particular outfit. 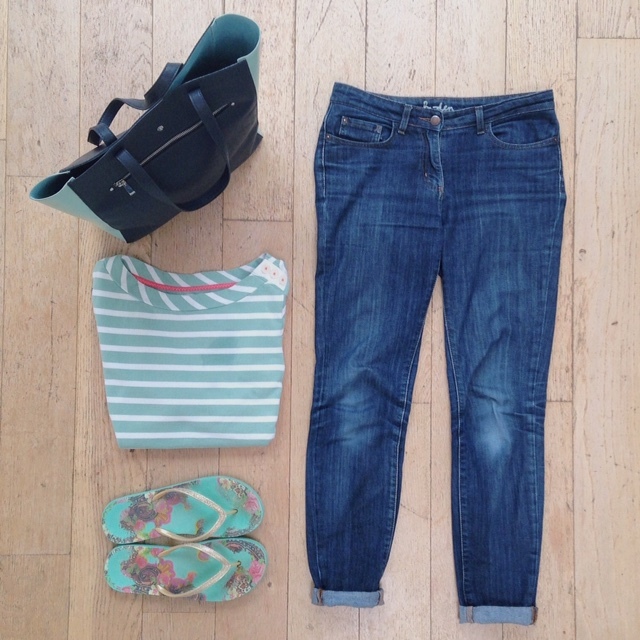 So, what to pack for a UK beach holiday when the weather is changeable? This is what I would take, from the items mentioned above for the same holiday next time. (It is worth pointing out that there was a washing machine in the apartment and that the list would have been more extensive if I hadn’t have been able to wash things midweek!). 2x long sleeved (or 3/4 length sleeved) breton tops. I wrote a similar post this time last year, what I packed for a beach holiday in Porto Santo. It was very different to this holiday and suffice to say no raincoat was required. Outfit: Sunglasses. Because the sun finally came out.